Seventeen years ago, I began putting biblical materials together to help Christians lead people to Christ. In 2009, I combined those materials into a workbook, “Saving Souls In The 21st Century.” My goal was to create a tool that would be easy to use while sitting across the table from friends and family trying to lead them to Christ. Let me share with you some information about the six chapters in this workbook. Chapter 1, “Sharing The Good News” has three studies designed to encourage you to reach the lost and tell you how to use the workbook. Chapter 2, “Leading Someone To Christ,” has six studies and is designed to lead someone to salvation through Jesus. Chapter 3, “Keeping Someone In Christ,” has three studies and is designed to teach the new Christian how forgiveness of sins works after baptism and about the church. Chapter 4, “Bringing Someone Back To Christ,” has five studies and is designed to bring a Christian who has left Jesus back to Him. Chapter 5, “Helping Us To Trust In God’s Word,” has four studies and will help people who do not believe in God and His word. Chapter 6, “Answers To Other Important Questions,” will help put biblical answers to other questions people are asking in our century. This is a workbook like no other! 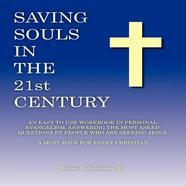 "Saving Souls in the 21st Century" is an easy-to-use workbook in Personal Evangelism. It answers some of the most-asked questions by people who are seeking Jesus. This book is a must have for every christian. 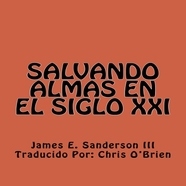 This workbook can be downloaded free in English or Spanish via the links below. If you would like copies in print for yourself, or for classes and groups, please contact me on the order page. Reaching The Lost - We May Be Their Only Chance! Now What? - Does A Christian Have To Be Perfect? The Church - A Vital Part Of Every Christian’s Life! Can A Christian Lose Their Salvation? - Is Once Saved, Always Saved Biblical? What Kind Of Love Do We Have? - A Feelings Kind Of Love Won’t Work! A Lifestyle Of Service - How Much Are We Willing To Give? The Amazing Proof Of Prophecy - The Bible Is In A Class Of Its Own! Is Jesus God? - You Don’t Want To Get This One Wrong! The Kingdom of God - When, Where And How Can I Become A Part Of It? The Sinner’s Prayer (Part I) - Is This Man Made Or Bible Made? The Sinner’s Prayer (Part II) - Can It Be Found In The Bible? Do I Need To Be Baptized To Be Saved? - Many Today Say: No! Is Baptism A Work Of Our Merit? - What Does The Bible Say? Is Baptism An Outward Sign Of An Inward Grace? Should A Baby Be Baptized? - Does An Infant Fit Into Baptism’s Design? The Thief On The Cross - Why Wasn’t The Thief Baptized Into Christ? John’s Baptism And Jesus’ Baptism - Understanding The Differences! Finding The One Baptism - Which One Still Applies Today? How Does God Predestine Us?